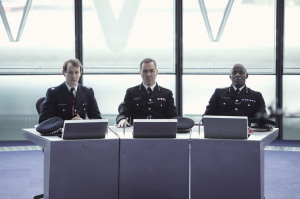 British comedy drama Babylon is about the people, politics and pressures in London’s police force and returns to Channel 4 for a six part series after a successful pilot episode. With accusations of racism, the use of lethal force, and corruption, Commissioner Richard Miller (James Nesbitt), who has the impossible job of keeping the capital safe, calls in American visionary from the world of new media Liz Garvey (Brit Marling) for a public image revamp. Babylon is written by duo Sam Bain and Jesse Armstrong (Peep Show, Fresh Meat) and stars an array of familiar face including James Nesbitt (The Hobbit, Cold Feet), Brit Marling (Another Earth, The East), Adam Deacon (Kidulthood, Adulthood), Paterson Joseph (Green Wing, Peep Show) and Jill Halfpenny (Waterloo Road, Eastenders). The pilot episode was shown in February 2014 and was created and directed by the legendary Danny Boyle (Slumdog Millionaire, Trainspotting) who is the executive producer for the series. The production visited the Metropolitan Police Training Ground in Gravesend where Robbie (Adam Deacon) trains at the firing range and features in episode two. The Metropolitan Police Training Ground in Gravesend is a specialized training facility and has previously featured in Incendiary (2008). Babylon starts on Channel 4 on Thursday 13th November 2014 at 22:00. This entry was posted in Filmed in Kent and tagged Adam Deacon, Babylon film locations, Brit Marling, Gravesend, James Nesbitt, Jill Halfpenny, Metropolitan Police Training Ground, Paterson Joseph, TV Drama. Bookmark the permalink. ← Experimental WW1 film Time Bleeds success!